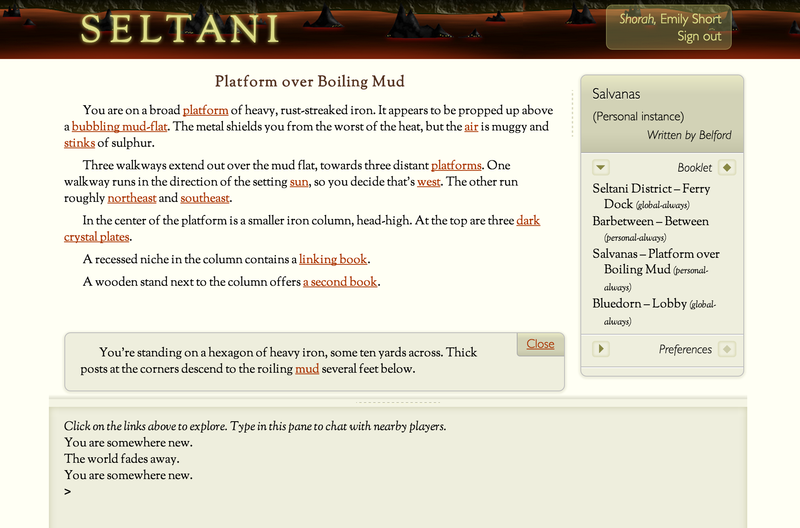 Seltani is Andrew Plotkin’s Myst-themed multiplayer universe riffing on Twine, in which authors can add their own explorable Ages. It’s been around for a bit over a year now, and includes the Barbetween age, which I’ve written up before. It just recently picked up a couple of new ages: Ryan Veeder’s interactive museum experience Bluedorn, and Andrew Plotkin’s own puzzle age Salvanas. It’s a timely development, given the considerable interest in multiplayer IF that turned up during our recent discussion on new directions in IF. Salvanas is a (fairly) compact piece of puzzle CYOA that adheres closely to the Myst genre traditions: empty, surreal landscapes populated with grand machinery; a hub world with three subordinate worlds and (I think) a final world to reach when you’ve completed the side structures. Salvanas is a personal instance, which as far as I can tell means that you can’t bring others into it. Thanks to the aforementioned first-puzzle stuckness, I haven’t finished the whole thing, but I also didn’t find any obvious places where changes you make might leave traces for other players (in contrast with Barbetween’s whiteboard, say). I may have missed/not found something, though. Bluedorn. Bluedorn is reminiscent of IF Art Show pieces: there aren’t any puzzles (though there are a few things that look like they might be puzzles); there are, however, a bunch of things to fiddle with and explore. The exhibits are reminiscent of things you might find in a real life science museum, but are explained by Myst-verse realities: there are animals that could never exist, and a meteorology exhibit works by shifting between worlds with different weather. The presence of other players is also fun. Many of the objects respond to manipulation either by popping up a description panel or by placing some text into the public chat stream: things that go into the description panel are only visible to the person who is doing the action, but anything in the public chat stream is seen by everyone, so you can watch others fiddling uselessly with crystals and peeking behind curtains. I enjoyed this, and would have liked even more of it. Sometimes there were actions that were described in-panel that seemed to me like they logically could have gone into the public stream (for instance, manipulating a large metal machine — surely everyone else in the room would be able to see you do that?). A multiplayer exploratory space seems like it would benefit from allowing people to demonstrate their surprising discoveries to the other players as much as possible. If you’re interested in catching a tour of Bluedorn yourself, this thread may tell you about future scheduled visits. This entry was posted in CYOA, interactive fiction, multiplayer, puzzles and tagged seltani by Emily Short. Bookmark the permalink. At the very end of Salvanas, gurer’f n arj ntr jvgu n sbhagnva, naq lbh pna svaq n ehar gung vapernfrf gur jngre yriry va gur sbhagnva. Gb zr gung frrzf yvxr n cbffvoyr pnaqvqngr sbe nssrpgvat bgure cynlref – znlor bapr rabhtu unir pbzcyrgrq gur Ntr n arj ybpngvba bcraf hc? Have you (or any other commenter) figured out what to do in the Tidal Sjorde area of Salvanas (the one with the boat)? I have figured out that gur frn evfrf naq snyyf va erny gvzr but this has not helped me find any actions to take. Inevitably, a few minutes after I posted that someone (specfically Ryan V) responded to the post I had put up at intfiction.